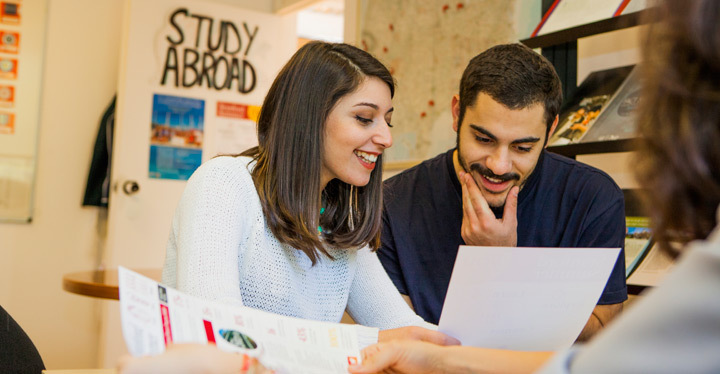 Study Abroad students who are enrolled at The American College of Greece (ACG) through an exchange program are eligible to apply for the Study Abroad On-campus Internship Program. Each intern will be assigned an onsite staff supervisor and together will work on semester long projects in order to achieve stated goals. Together with the award of an internship certificate upon completion, students will be compensated accordingly. For more information please contact the Office of International Student Services at [email protected]. Applications are submitted to the Office of International Student Services and forwarded to the respective ACG offices’ hiring managers for evaluation. These are internship opportunities not for credit. Internships take place during academic semesters (Fall or Spring), Summer Sessions (I & II) and are limited to max 15 hours/week. Students selected to participate in the Study Abroad On-Campus Internship Program will be contacted for an interview with the respective ACG offices’ hiring managers, given that the applicant fits the position’s profile. Have applied for a study abroad term at ACG. Have a grade point average [GPA/CI] of 3.00 or higher. Each internship position may have additional eligibility criteria and requirements. The Study Abroad On-Campus Internship Program offers our students the unique opportunity to enrich their study abroad experience and promotes cross-cultural interaction in an international academic environment. We invite you to join The American College of Greece on this engaging educational journey! Applications are submitted to the Office of International Student Services and forwarded to the respective ACG offices’ hiring managers for evaluation. These are internship opportunities not for credit.